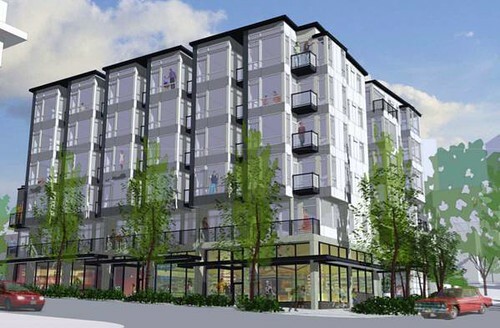 Last spring we wrote about a planned development for 401 E. Pike and how the economic downturn had transformed plans for a mixed-use building on the site. Now, a mixed-use developer’s loss is Northwest School’s gain. The school today announced it is acquiring the land to build a new gym and offices. Details below. We’re told the final sale price was $2.3 million. (Seattle, WA – May 26, 2010) The Northwest School announces the acquisition of 401 E. Pike Street, bordered by Crawford Street and Bellevue Avenue. Currently a parking lot, this site will be used to expand the school’s facilities to enhance its programs and offerings to the student body and the surrounding community. Initial plans include the addition of a gymnasium and office space. Since its inception, the school has benefitted from the use of wonderful athletic facilities around Seattle, but has long desired a gymnasium close to its academic buildings to advance the school’s athletic and physical education curriculums. The Northwest School, one of the leading college preparatory schools in the Pacific Northwest, offers a strong athletic program, including varsity sports participation in basketball, cross country, soccer, track and field, volleyball, and Ultimate Frisbee. Currently, the school is home to one of the top high school female distance runners in the nation, a state and national record-holder in such events as the 800m, 3200m, and the indoor mile. Additionally, the school’s girls’ varsity Ultimate Frisbee team placed first in the USA Western Conference Championships, and the boys’ varsity Ultimate Frisbee team was recently crowned Washington State Champions. Northwest’s soccer and basketball teams also competed well this fall in league playoffs. For more information about this property acquisition or The Northwest School, please contact Nicole Brown, Marketing & Communications Manager at nicole.brown@northwestschool.org or (206) 816-6206. The Northwest School is an independent, co-educational, day and boarding, college preparatory school, serving 465 students in grades 6-12. Founded in 1980 and located in the historic Summit School building on Summit Avenue, The Northwest School is celebrating 30 years of excellence in education, with focus on college preparatory academics, environmental studies, and a multi-disciplinary curriculum of humanities, arts and sciences. For more information, visit www.northwestschool.org. Perhaps the school can leverage the community use of the church’s building up the street? I’m not sure how or what, just noticing the proximity of the two and potential room for collaboration. Ooh, I know: shop class. A few neighbors mentioned tool rental and workshop; the school could then use the place for shop since community demand would be lower during school days. It’s exciting that Northwest is able to purchase this space. One question though, what will the uses on Pike Street be? One concern with the Church property is breaking up the blank wall on E. Pike on the walk from Boren up the hill. What about a school art gallery? The church has been exploring small neighborhood retail. I like the shop class idea as well – what about a 3-D printer and prototyping machine set up, with classes for students and the community, and a ultra-local manufacturing facility? I moved away in 2007 after 20 years in Seattle, 2 years spent living and many more enjoying life on Capitol Hill. Was 501 E. Pike a block of businesses I should remember? Yes. Kincora (Irish pub), Bimbo’s Bitchin’ Burrito Kitchen, Manray (gay bar), The Bus Stop (bar), and Pony (gay bar). I think the Cha Cha lounge used to be on that block also..? I live 3 blocks north and was really disappointed when it was torn down. I’m also disappointed that it’s not going to be replaced with more eateries/bars. Pete, you’re off by one street and a block or two. The Pike space has been a parking lot for as long as I remember. Perhaps an old timer will come along to clear up previous history.